This was originally meant to be my contibution in the Coffin Corner2 "Name contest". Neeless to say I didn't make the deadline, but finished my model about 1 month late. The name given to me was "The dentist showrod". I later re-named it "Toothache". 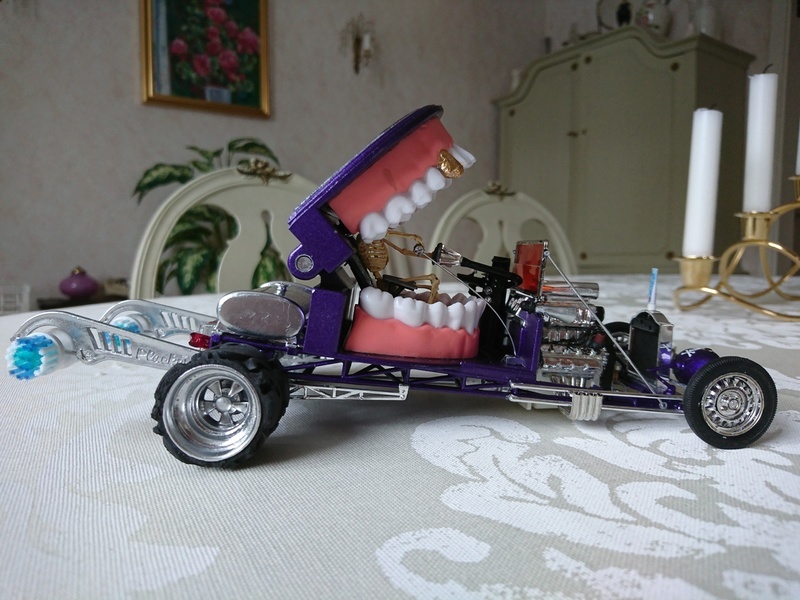 As You can see most parts are different dental objects incorporated in th build along with a widened frame and the engine from AMT's Digger 'Cuda showrod/funny car. 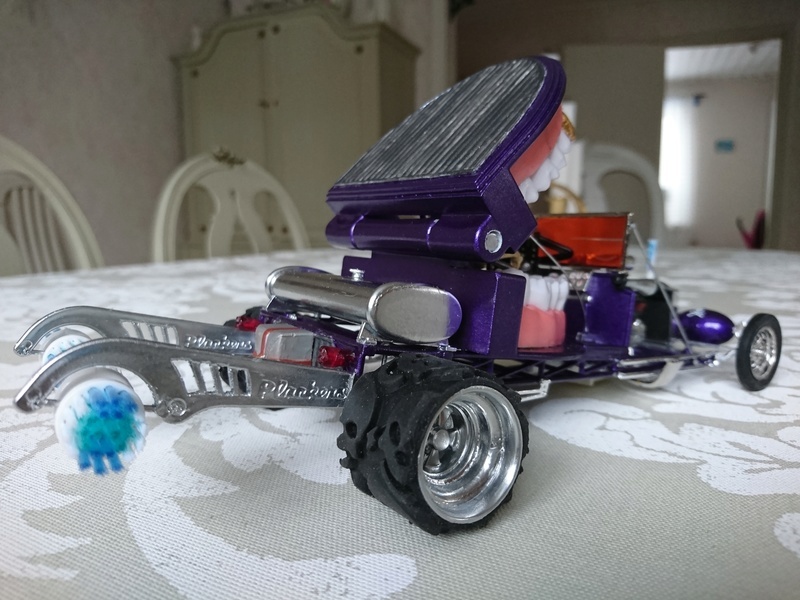 I mounted an extra blower to the engine and took the wheels from my parts bin (The rear tires are pieces cut from a bicycle handle having skull pattern). The drivers seat was all scratchbuilt along with numerous other parts! The taillights are supposed to look like human teeth ! Let me be the first to say this ride is unreal … and super cool! A wonderful, fascinating combination of creativity and fun … and that’s what model building should be all about. Thanks for posting and sharing your imagination and fine workmanship. Far out show rods rock! No wonder this site is dying too right behind MCM. If people don't support this hobby and this forum it will continue to go away and those responsible won't have a clue why. This thing put a smile on my face. Lovs the wheelie bars. 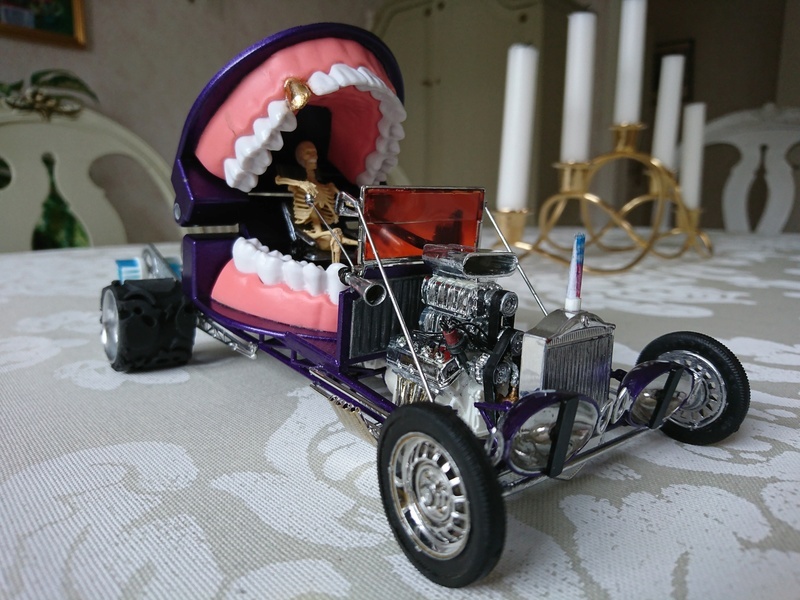 Did you get your ideas from a model building dentist ? Well Done and very Hilarious ! Showed this to a friend who makes dentures . He laughed so hard he almost choked . His words were , and I quote " Looks like that should be in Godzilla's Mouth .He'd really know about Hot Breathe with that things exhaust " Very nicely done " . Awesome and From the lady friend ' Cute "
You ! Hugger of Trees ! How the heck are ya ? You are right , But quit braggin . Soon you'll have so many transplants they will call it Orefornia ! Then it won't be so beautiful . That's one way to display Grandpa's old dentures. Very innovative and well done! This thing is great. Very well done. Super whimsical and creative. 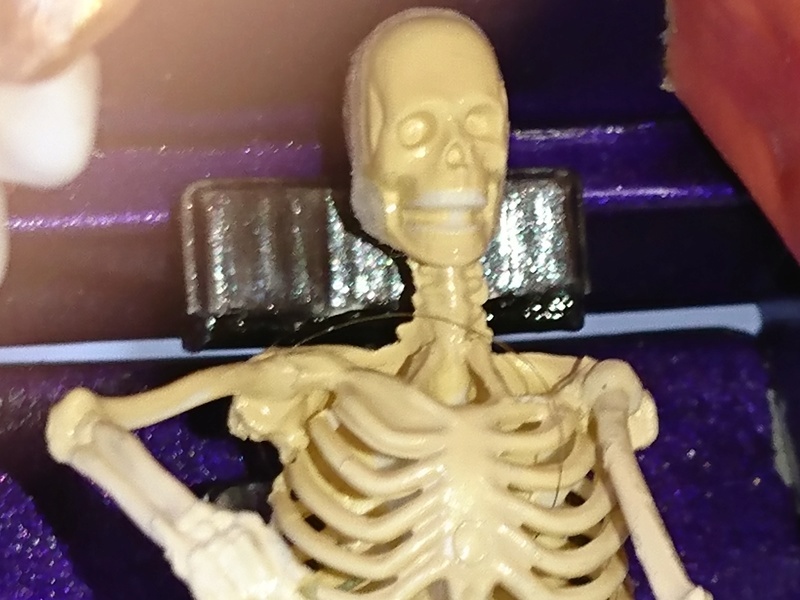 I especially like how the skeleton has the Simon Cowell bleach job.